Tucked away down a long farm track, the barns at Hawthbush Farm have been lovingly converted in a fresh, uncluttered rustic style. This listing is for 2 cottages rented together (sleeping 13) - the 4 bedroom Cowshed (sleeps up to 9) and the 2 bedroom Granary (sleeps up to 4). Furniture is wooden, floorboards pale grey, there are country dressers, delicious beds and a beautiful mix of new and old – Smeg fridges and wonky beams, iPod docks and feeding troughs! 100Mb+ Superfast fibre broadband Wifi is provided. There is a wood fired Hot Tub with views over the rolling countryside and all barns are heated by a central wood fired boiler. Lisa and Toby (Zac and Didi too!) 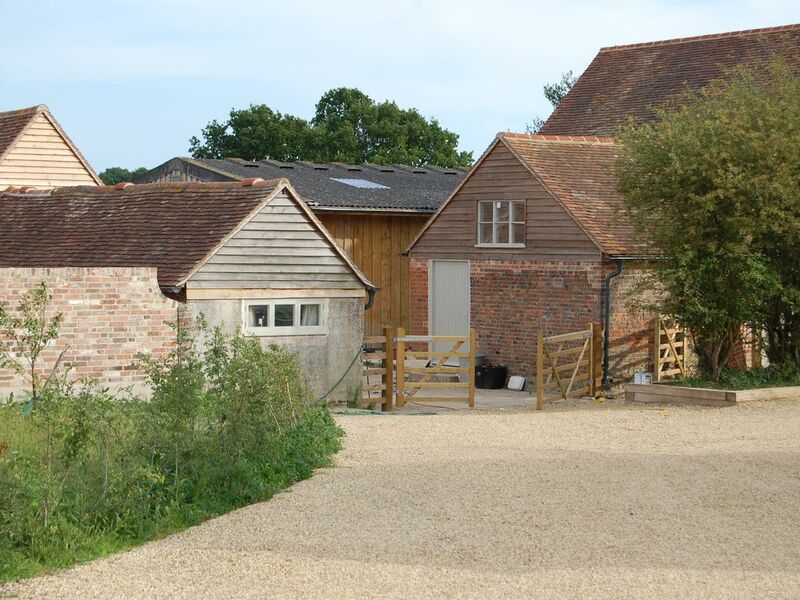 run Hawthbush Farm and live in the farmhouse a short distance from the holiday cottages. Please get in touch if you have any questions or requests and we will be pleased to help you. The Cowshed has a large open-plan living area downstairs leading to a huge farmhouse kitchen with a fabulous farmhouse table seating up to 12. Wellshurst Golf and Country Club, 2 miles away. East Sussex National Golf and Country Club, 8 miles away. Notes on accommodation: Please contact owner. Outside: The Cowshed has a large patio leading to a wildflower garden. Outside is a wood fired Hot Tub shared by both barns. We rented The Cowshed for Easter and had an amazing time. The centerpiece and the main attraction for us was the kitchen which proved to be the most perfect entertaining space. We had several meals for 10+ around the table and were very comfortable. We love to cook so were pleased to find that the kitchen was very well equipped. On top of this the beds, bedrooms and the rest of the house in general was very comfortable and very chic in a rustic kind of way. We also had the pleasure of meeting Toby, Lisa and family. We enjoyed our stay so much that we plan to come back at Christmas. Thanks so much for a memorable stay! Normans Bay, 20 mins by car through the beautiful Pevensey Levels. Gatwick 50 minutes drive. Newhaven Port 30 minutes drive. The Gun Pub <1 mile. Chiddingly Village 3 miles. Lewes for shops and antique emporiums 10 miles. Drusillas Zoo 8 miles.